Crest’s latest series delivers on an A3 colour system that is a perfect entry model for businesses looking for excellent value for money. A tablet-like, pharm customisable user interface lets you enjoy the same sophisticated technology. Deliver impressive document output at a speed of up to 25 ppm and cover all print, store scan, copy and fax needs of modern businesses. The Toshiba e-STUDIO 2500AC has a new high-quality 22.9 cm tablet-style multi-touch screen can be personalised according to a user’s preferences and needs. It starts with the background image, which can easily be exchanged and continues with personalised views. You can change the order of the icons on the home screen, add or remove buttons and decide how many icons should be displayed per page, so that all functions present themselves to you in a way most useful to you. The Toshiba e-STUDIO 2500AC model fulfils the highest security standards to protect your data from unwanted access. So whether you are looking for document security, device security or access security – our new system has it all. 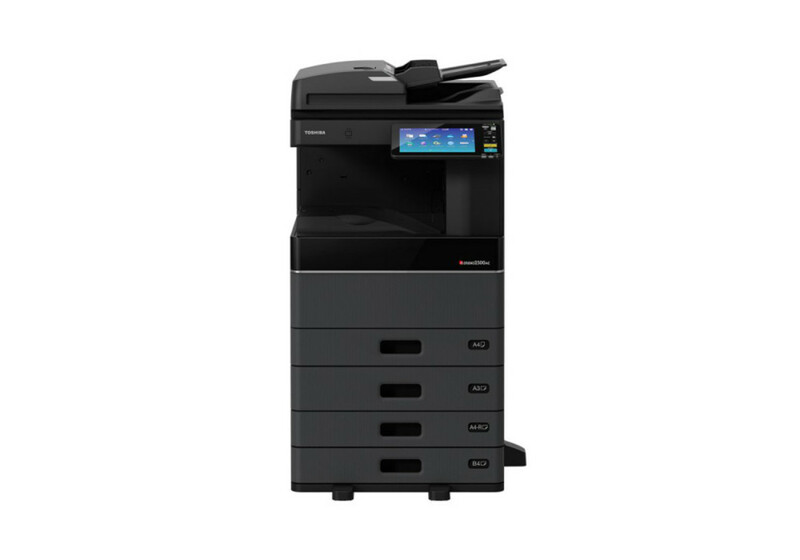 For small and medium businesses and workgroups that demand colour along with a small footprint, Toshiba has answered the call. The e-STUDIO 2500AC series is packed with industry-leading technology and innovations designed to help workgroups connect, integrate and simplify. Paper Volume Indicators on the control panel make it easy to see the paper sizes, types and levels in each cassette. Multi Station Print Solution allows you to retrieve your print job from a series of networked MFPs via simple authentication. Inside Pocket for Authentication Card Readers built into the systems for a cleaner look and safer use.